Keleti train station in Budapest, in the night from Friday 4th September to Saturday 5th September. A few minutes after midnight, public transport buses arrive sent by the Hungarian government, to bring the refugees who have been camping at the train station for about a week to the Hungarian-Austrian border. Still suspicious that this might be another devious trick of the government, many refugees hesitated for a while and observed the situation. Eventually, they started boarding the buses to begin the next journey, towards the next border. After days of endurance they were finally on the road again. After days of boiling heat, a light rain suddenly started to fall, as if the weather also wanted to put an end to this week of struggles. In the course of the night and during the following day, more than 10.000 refugees crossed the Austrian border. Austria and Germany had agreed on allowing their entry, and many more people followed. Hungary was the first Schengen country that migrants on the West Balkan Route would reach, after Greece’s de facto withdrawal from the Dublin system in 2011. 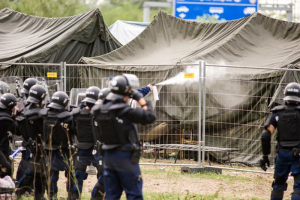 Formally responsible for the implementation of the asylum procedures, until August Orbán’s government tried limiting the number of migrants with deterrence strategies. Migrants were systematically apprehended by the police after crossing the border, and then detained in registration camps in inhuman conditions. This policy of deterrence might still have been a realistic strategy in June with a few hundred migrants entering the country per day, but when the numbers increased to more than 1000 per day in July and more than 3000 per day in August, there was simply no more space in the camps. Similar to the longstanding practice in Italy, migrants were released after a few days and could continue their struggle to Budapest. As dawn breaks, ghost-like figures with sunken heads laden with babies, bundles of food and clothing can be seen trudging slowly along the autobahn. Alongside the usual tips on tailbacks and delays, traffic bulletins on the local radio alert drivers to ‚pedestrians who have been spotted on the A3 between the Austrian border and south Passau‘. The scenario is not a one-off, but has become a familiar sight for the residents of the southern German town of Passau, as people traffickers drop off a daily average of 700 refugees – mostly Syrians, Afghans and Iraqis. As soon as the smugglers’ vehicles have crossed the border between Austria and Germany, they abandon the refugees in woods, fields, secluded farms, and even on the hard shoulder of the motorway. The police was permanently patrolling through the train, and migrants who were trying to board the train on subsequent stations were immediately thrown out with the words: „Hey my friend, go out!“. I witnessed these controls for months. They often involved trinational operations, i.e. German and/or Austrian police’s ’support‘ or rather surveillance of the Hungarian police, in order to ensure that there was no ‚Laissez-faire‘ on the trains. On August 27, the Austrian police discovered a refrigerated lorry with 71 dead persons inside. They had suffocated in the back of the truck, on a parking lot near Vienna. The politicians and media employees who appeared to show the most outrage about the tragedy, were those who welcomed this opportunity to close the route to migrants. But there was also real outrage from Hungarian activists, who criticised the racial profiling on the trains and and demanded to „Let them board the trains!„. Even UN Secretary Ban Ki Moon demanded „safe entry routes for refugees“ and added a summit on the topic to the agenda of the UN General Assembly. In the ensuing days, large-scale traffic controls were implemented on the highways from Hungary leading to Austria and Germany, causing traffic jams of up to 50km in length. After another protest action today around midday, the atmosphere now (14:00) is one of tense tranquillity. Meanwhile, even more people than yesterday have arrived at the train station. One can certainly speak of thousands. The police blocked all entries to the station for refugees. Perhaps already tonight, or by tomorrow morning at the latest, the situation is likely to escalate completely: Either there will be an uprising, or a brutal large-scale police action. Or both. The rumour was that Germany would pick up the refugees stranded in Hungary with a special train, while the Hungarian police was withdrawing completely from the station. A run on the trains (#trainofhope) began, and in the course of the day several thousand refugees were able to leave Hungary and arrived in Vienna and Munich a few hours later. Once these kinds of rumours spread and are visibly confirmed by the circumstances, there is no turning back without the use of violence. The German and Austrian interior ministries – vocationally fixed to a more repressive approach – probably put Hungary under pressure, or maybe the Hungarian government itself saw itself in the obligation demonstrate a hard hand. In any case, the access to the trains at Keleti was forbidden to migrants again the next day, although at least 3000 migrants were still staying at the station, and every day more people arriving. Thursday September 3 saw the climax of the fight for the Right to Move in the year 2015. For a few days, the European project of the exclusion of social conflicts, the balance of social degradations, the management of refugees and even the project of political rationality itself, was profoundly questioned and compromised; just as deeply as it had during the Yugoslav war. On this day, all international train connections were suspended, while the refugees were told that they could take regional trains to the Austrian borders. However, the first train with around 600 refugees was stopped and surrounded by police around 35 km outside of Bucharest in a town called Bicske. The place in question was the location of one of the Hungarian refugee camps, to which the police wanted to transport the people in the trains. The people refused to exit the trains at the discovery of the deception and endured on-board the trains for around 30 hours. At the same time, news of the trick spread, and consequently no more refugees boarded the trains. Friday, September 4, marks the current climax of the struggle for freedom of movement. As already announced the day before, several thousands of refugees started walking on foot in the early afternoon, the beginning of the 170km march to the Hungarian-Austrian border. Their declared aim: Austria and Germany. Also in Bicske, around 300 of the refugees who had been stopped on the previous day started marching on foot and walked westwards along the train tracks. In the morning already, another 300 of the refugees contained in Röszke near the Hungarian-Serbian border had overcome the fence around the camp. They were later intercepted by the police. The refugees remaining at Keleti train station were attacked by Hungarian hooligans in the afternoon, but were able to defend themselves against the attack. The March towards the West advanced relatively quickly, and soon reached a two-lane highway. The news about the departure of so many spread over the media almost in real time under the hashtag #marchofhope. The images of the march will enter the iconography of this long Summer of Migration; a long line of people reclaiming their own mobility after a long week of endurance, leaving Budapest in a collective and spontaneously coordinated action. The EU foreign ministers are congregating in Brussels. The Austrian minister Sebastian Kurz consults his German colleague Frank-Walter Steinmeier. He expresses that the conditions in Hungary are catastrophic, and that Germany and Austria need to act. Steinmeier calls the Chancellor. … (Later) Merkel has a telephone conversation with the Austrian Chancellor Werner Faymann, with the interior minister de Maizière, again with Steinmeier. Then the decision is taken: The refugees will be brought to Germany in special trains. On the official surface, none of the ministries raises objections – but the specialised bureaucrats emit urgent warnings. The officials in both the exterior and interior ministry warn that the decision will incentivise more refugees to come to Germany. Merkel does not care. She is concerned about Europe’s reputation. What would the world think about images of old or pregnant people collapsing from exhaustion on their way to Germany? Within hours, the Hungarian government organised the bus transport to the Nickelsdorf border crossing. Immediately after the departure of the March of Hope, activists from Vienna had announced that they would send a convoy of buses, taxis and PKWs for the transport of migrants. The convoy would have started on Sunday, but soon proved to be unnecessary. 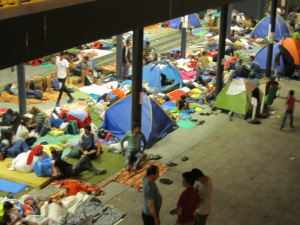 On Saturday night already, 4000 migrants had been transported to the border with Hungarian buses, and the first had already boarded the trains to Germany. 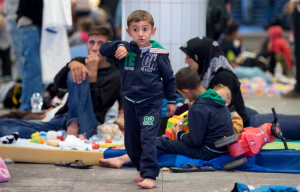 During this one weekend, at least ten thousand refugees arrived in Germany. In Munich, they were greeted with applause, lunch packets and toys for the children. The people rest at a junction approximately 30km away from the city. An activist manoeuvres back and forth on a motorbike and announces good places for sleeping through a megaphone. Some take a rest behind the crash barrier, while others lie directly on the hard shoulder. Volunteers from the surrounding villages bring water and food, the driver of a truck with a Turkish number plate throws his jacket out of the window while driving past. The solidarity is palpable here. What the exhausted people do not know in this moment is that their March of Hope is writing history. During these minutes, the German and Austrian governments announce that they will break the paradigms of European migration policies and are willing to receive the refugees. Late in the night from Friday to Saturday, the first busses reach the displaced to bring them to the border. But refugees remain sceptical. After the deceit with the train going to the camp in Bicske, the level of distrust against the Hungarian government is high. While the police wants to clear the highway as quickly as possible, the Syrians formulate their demands: A first test bus must cross the border, before the other busses are permitted to leave. The police give in. After the message about the first bus reaching Austria arrives, there is no holding back: everybody wants to go. The result is a convoy of 120 buses moving towards the border – a true fall of the wall. At the break of dawn, thousands of people cross the border by foot in the rain. Once again, a border falls between Austria and Hungary – the comparison with 1989 is in the air. New levels of escalation have been reached. While Orbán played the boss in Brussels yesterday, 500 migrants were lured into a train in Budapest – which did not bring them to the border, but was instead stopped by the Hungarian police in Bicske, 40km outside of Budapest. The migrants were supposed to be transferred into buses and transported to a camp. But they refused – and now, 30 hours later, the bus is still standing in the same place. The police are still hesitating to conduct a violent eviction. Meanwhile, thousands of migrants who overcame the fence were interned in a camp in Röszke, just behind the Serbian-Hungarian border. The camp is surrounded by a line of police. Nevertheless, a group of 300 persons managed to escape. They are now being chased by the police. Another 2300 people announced that they would try to break out together. The border crossing in Röszke was blocked. The 600 persons, who were still enduring on the train in Bicske on Friday, continued to refuse to be transported to the camp for registration. Half of them started walking by foot in parallel to the March of Hope, along the train tracks, in the direction of Germany. The other half was eventually evicted by the police. Friday, 17.45. After 30 hours of standstill, the Hungarian police began evicting the train occupied by several hundred refugees in Bicske. They took a first group, mostly children, through an underpass and directly into a bus. The camp the people had tried so hard to avoid was waiting for them. After almost one and a half days of resistance, the people seemed to surrender to the state’s supremacy. The Bicske refugee camp is not located far away from the train station, and has space for around 1000 people. It is the only one of the five camps in Hungary, where refugees are allowed to leave without restrictions, says Marc Speer, a board member of Bordermonitoring Europe. The extensive former military site is surrounded by a fence that the EU sponsored for around 1.5 million Euros, a sign behind the barbed wire proudly declares. „During the summer, the camp was sometimes filled to the extent that people had to sleep in tents outside“, Speer explains. By now, many had given up their places and continued westwards. „Nobody wants to stay in Hungary“. There is a three-meter-high fence, crowned with NATO barbed wire. Behind it stand armed guards and riot police in combat gear. This is the first ring. Cars and buses park here, and barracks and sanitary tents have also been erected. 30 meters behind the first ring follows a second one, another fence without barbed wire, which surrounds the camp where refugees are accommodated in tents. New people continue arriving in front of the camp, they have no option but to sit in cramped conditions on the sand ground, guarded by a cordon of riot police with surgical masks and rubber gloves. A German shepherd barks at the people crouching on the floor. The new preliminary reception camp in Röszke at the Serbo-Hungarian border evokes a welcome culture reminiscent of Guantanamo. 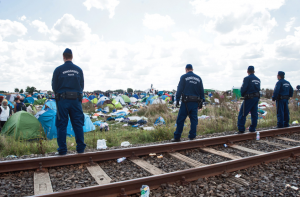 Neither aid workers nor journalists have access to the camp. Breaking out of the camps was the required counterpart of the March of Hope. Prior to the events, there was no doubt about the intention of Orbán’s government to intern migrants in camps in the long run. Orbán had declared a state of emergency in the border regions and would have liked to present the ministerial conference in Brussels with a fait accompli – a border fence and closed internment camps. This scenario was prevented by the resilience of migrants on the March of Hope and on the train tracks before Bicske, in conjunction with the resistance of migrants interned in Röszke, who avoided becoming hostages of Orbán’s government by fleeing from the camp. The refugee camp in Röszke in southern Hungary is still the scene of confrontations. 300 people broke out of the camp in the course of the day, some of them were brought back by the police. Refugees continue to throw stones at the police in protective riot gear. The officers respond with tear gas attacks. Such is the description tweeted by Szabolcs Panyi of the news portal http://index.hu/. Moreover, he speaks of 2800 refugees facing 200 police officers. In comparison to the historical events described above, the passage from Serbia across the border to Hungary during the following ten days, until the closure of the last gap at the Röszke train tracks, was relatively unspectacular. Merkel and Faymann’s announcements that the borders to Austria and Germany would remain open without a number cap removed a lot of pressure. 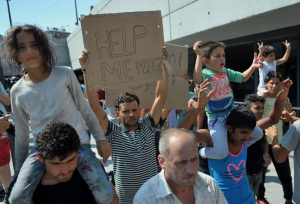 None of the countries concerned – from Macedonia over Serbia until Hungary, and later also Croatia and Slovenia – had to worry that thousands of migrants might become stranded on their territory. The ruthlessness of the Orbán-government had become reduced to a rather farcical caricature of its own self. The camp in Röszke did not turn into a concentration camp, but remained a ’normal‘ transit camp for another 10 days, with insufficiencies and chaotic scenes similar to the ones in Gevgelija or Presevo. Two kilometres away, directly at the border, the scenes are completely different (in comparison to the camp). There are no traces of military-martial performance: hundreds of people crowd together on a littered field next to the train tracks. This is the place where refugees arrive after crossing the border. Police officers prevent them from continuing. The people wait for the buses for hours, while volunteers distribute food, drinks and blankets. Eventually, the preliminary reception camp in Röszke becomes full. Therefore, many refugees have to spend the cold and windy night to Monday outside without shelter. The authorities appear to be completely overwhelmed with the situation, incapable of organising basic emergency reception facilities. At least, the rescue services arrive and look after the children with fever and flu. Peoples, don’t you hear the signals? Did we just solve the refugee crisis? Keleti is silent. The only mark left from the migration crisis is a governmental poster on a bus stop, stating that “the nation has decided this country has to be protected”. Are we now protected, or are the terrorists now here – or wait, was it only their cellphones that are left? Against what are we protected, again, and why do we continue building those fences? Where are all the migrants? Is the migration crisis over? Budapest seems peaceful and silent after the burning hot crisis that was in front of our eyes during the whole summer. It is a tempting idea to think that it’s over. We are reading about heroic volunteers all over Europe, about amazing people starting new lives in Germany, even the childkicking racist news reporter is not a newsreporter any more. Couldn’t we just call it a day and get on with our lives as it were, and disregard the fence the fence that “protects” us? Oh no, that’s not a good idea. Migration will not stop, the least because of some government closing its eyes and borders. Refugees are still coming. Actually, more people than ever in 2015 are crossing the borders of Europe these days. The crisis has merely vanished from our eyes. 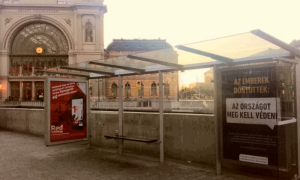 The Hungarian government has made it invisible to the everyday experience in the capital – and because of that, neither does it bother the mainstream media. They wish to communicate to the public that the Fidesz government has “solved” the issue with the fence, when in fact the crisis has only moved some hundreds of kilometers south and west, and is far from being solved.